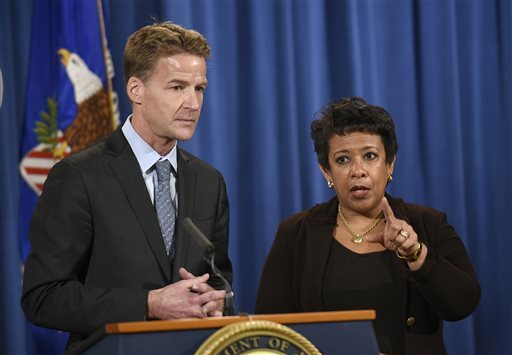 In this Dec. 7, 2015 file photo, U.S. Attorney General Loretta Lynch, right, and U.S. Attorney in Chicago Zachary Fardon speak at a news conference at the Justice Department in Washington about an investigation of the Chicago Police Department. Federal officials are meeting with Chicago police Wednesday, Dec. 16, 2015, as the U.S. Department of Justice launches a civil rights probe triggered by the shooting death of a black teenager by a white police officer. CHICAGO (AP) — A federal civil rights investigation that will look at one of the nation&apos;s largest police departments began in earnest Wednesday, with Chicago&apos;s top officer saying Department of Justice agents were expected to sit down with top Chicago police brass. Interim Superintendent John Escalante told a city council hearing Tuesday police are entering uncharted territory as they prepare to answer inquiries. "We have not been through anything like this before," he said. U.S. Attorney General Loretta Lynch announced the investigation Dec. 7 amid protests over the release of a video of the 2014 fatal shooting of black teenager Laquan McDonald by white Officer Jason Van Dyke, who is charged with murder. Chicago joins a long list of other police departments that have been looked at, and the DOJ has opened 23 since the start of the Obama administration, its website says. Among those are Baltimore and Ferguson, Missouri, where the fatal police shooting of 18-year-old Michael Brown in 2014 prompted months of protests. A few investigations were closed without a finding of constitutional violations. Based in part on how such investigations have unfolded in elsewhere cities, Wednesday&apos;s meetings are most likely get-acquainted sessions. There&apos;s no rush: Investigations of far smaller departments have taken more than a year to finish, and it&apos;s likely the one into Chicago&apos;s 12,000-officer force will be the same. The head of the Chicago police union, Dean Angelo, told WTTW-TV he already met with the U.S. assistant attorney general for the civil rights division, Vanita Gupta, who leads the investigation. Angelo described it as an informal, off-the-record talk, and said he conveyed that the union wanted to "help facilitate the moving parts of the investigation." While staff from the Justice&apos;s Department&apos;s civil rights division takes the leads the investigation, the U.S. Attorney&apos;s Office in Chicago will provide support. Federal officials say they won&apos;t provide updates as the investigation goes along. Over coming months, investigators will talk to everyone from beat cops to city leaders, which is likely to include Mayor Rahm Emanuel. Investigators will even ride along with officers on patrol and observe how they interact with area residents. They&apos;ll also go through thousands of police records. A key component is also community outreach — talking with families of Chicago residents shot by officers, likely setting up a hotline and email for tips and holding town hall meetings to get direct feedback from the public. One reason a civil rights investigation takes so long compared to criminal investigations: It is vast. The DOJ will scrutinize Chicago police from top to bottom as agents try to determine if there&apos;s something systemic in how the department works that leads to patterns of abuse that violated citizens&apos; rights enshrined in the U.S. Constitution. Among the many questions federal investigators will answer in a final report: Is there racial bias in the use of force by officers? Are abuses widespread or are isolated to a few rogue officers? And do systems that are supposed to hold officers accountable actually work? The investigation comes first, followed by a publicly released report. Then, Chicago and the DOJ will endeavor to hammer out a reform road map to bring about change that sticks. Most of the time, cities enter agreements voluntarily, the DOJ said. But sometimes, the sides disagree on critical provisions and must fight it out in court.